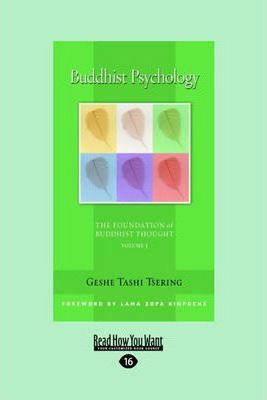 This new volume from the Foundation of Buddhist Thought series, provides a stand-alone and systematic -but accessible!- entry into how Buddhism understands the mind. Geshe Tashi, an English-speaking Tibetan monk who lives in London, was trained from boyhood in a traditional Tibetan monastery, but he is adept in communicating this classical training for a modern Western audience. Buddhist psychology addresses both the nature of the mind and how we know what we know. Just as scientists observe and catalog the material world, Buddhists for centuries have been observing and cataloging the components of our inner experience. The result is a rich and subtle knowledge that can be harnessed to the goal of increasing human well being.